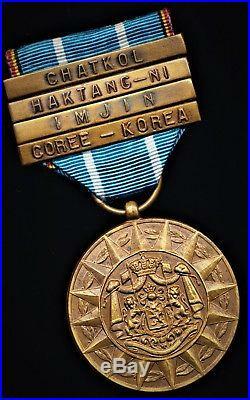 Belgium: A scarce MAXIMUM issue'4 Clasp' Overseas Campaign Service Medal for the Korean war with all 4 x clasps. 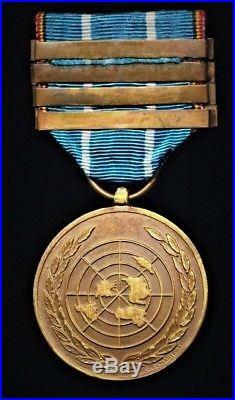 Belgium: Overseas Campaign Medal 1951 (Medaille Commemorative Des Theatres D'Operations Exterieures 1951). 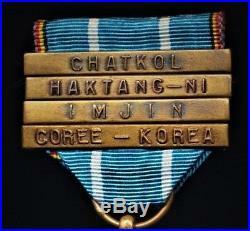 4 x clasps'Coree-Korea','Imjin','Haktang-Ni' &'Chatkol. (See'High Resolution' pictures attached). 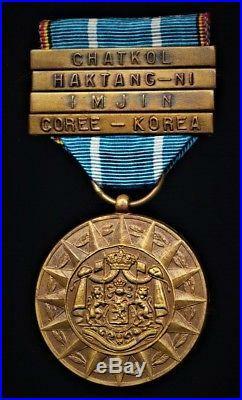 The medal has thus far only been awarded for service during the Korean War. Note: Only an estimated 3178 x Belgian and 78 x Luxembourg personnel served with Belgium United Nations Contingent B. This the maximum issue number of clasps on this medal for the Korean War - and very scarce to find multi-clasp examples on the market. See Other listings: See my other listings of items for sale for a good selection of British & World Medals, Free Mason Memorabilia, Hong Kong Police, etc. International Tracked & Signed, (or, International Tracked to selected International PO Box Destinations): GBP 50. If you can't or wont do this, then the sale will be cancelled. The item "Belgium Medal Overseas Campaign Service Medal for KOREAN WAR & maximum 4 clasps" is in sale since Monday, August 13, 2018. This item is in the category "Collectables\Militaria\1946-1960". The seller is "benachie" and is located in Aberdeen, Aberdeenshire.